In the first part of this series published last week (available at: http://www.ft.lk/article/525181/Sri-Lanka-faces-crucial-tests-ahead- with-growing-opposition-to-ETCA ), it was pointed out that the secrecy surrounding the proposed Economic and Technology Cooperation Agreement, now commonly known as ETCA, had left both supporters and opponents in a state of confusion. As a result, fear has engulfed the local professional bodies of every description that Indian professionals would flood Sri Lanka’s limited job markets. Such a flooding, it has been argued by protesting professionals, would not only displace those currently employed in respective professions but also deny opportunities to those waiting to join them in the future. In this background, the article also commended that one of the ardent opponents to ETCA, the Government Medical Officers’ Association or GMOA, has developed a rich webpage giving publicity to both critics and supporters of ETCA equally, a good practice which the Government should also consider emulating. Hence, the article concluded that in the name of good economic policy governance to which the present Government is committed, a wide and continuous consultation should be conducted between the Government and ETCA’s main stakeholders. The critics of ETCA have equated it to the old Comprehensive Economic Partnership Agreement or CEPA that was negotiated with India during 2002-2003 and was to be implemented as from late 2004. However, with the change in government twice, first in 2004 from one party to another and later in 2005 within the same party, CEPA was permanently shelved from the Sri Lanka side, though India was still keen on having it with Sri Lanka. But later in 2011 when Sri Lanka was faced with a severe balance of payments problem, the Government led by Mahinda Rajapaksa attempted to bring it back to life. An announcement was made by the Government that it would appoint an inter-governmental-agency committee to look into CEPA and make necessary suggestions to implement it. However, no action was taken to make it a reality and CEPA thus remained dusting in the shelves of the Department of Commerce which had given leadership to drafting it until there was a change in government again in January 2015. 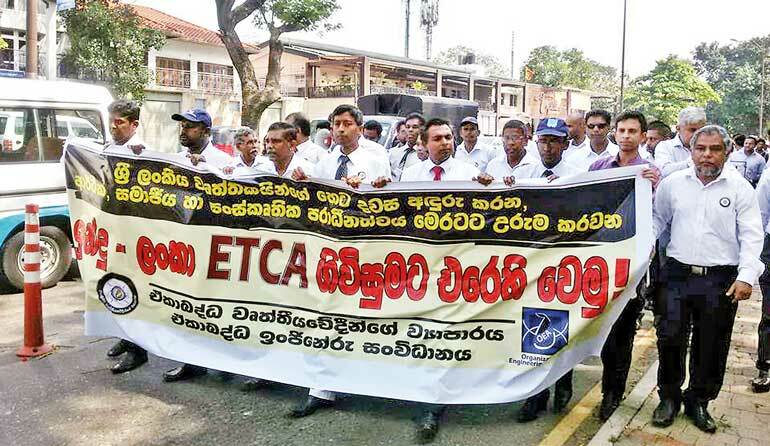 Taking note of the widespread protests which CEPA had run into earlier by a section of the services sector organisations in the country, the new Government, it appears, has presented it in a rebranded form called ETCA after deleting some key contentious provisions. It is this ETCA which has been the target of protests by almost all the professional bodies of the country organised loosely today as the United Professionals’ Movement or UPM. Hence, it is necessary to revisit CEPA, identify its key elements, document how bilateral trade negotiations are conducted between countries and examine how ETCA differs from CEPA. Trade negotiations involve a long-drawn process which sometimes runs into several years. It took nearly two years to negotiate and conclude the draft CEPA in 2003. The process is kicked off by a country interested in entering into a trade agreement with another country by making a proposal to do so. If the other country agrees, a study group is set up consisting of representatives of both countries drawn from key stakeholder institutions. In the case of CEPA, the Sri Lankan side was headed by Ken Balendra, a reputed entrepreneur and one-time Chairman of the John Keells Group and had the representatives of the Central Bank, IPS, Trade Chambers and key Government departments. The Indian side was headed by Rakesh Mohan, a Deputy Governor of the Reserve Bank of India at that time and now the Executive Director at IMF representing India, Sri Lanka, Bangladesh and Bhutan. There were rounds of discussions that enabled both parties to agree, disagree, modify and finalise the final form of CEPA. Once the study group comes up with a final draft, it is submitted to the respective governments for concurrence. Then only the relevant authorities of the two governments are able to ink the agreement. In this process, the proposed ETCA is still at the very first stage of negotiation. What was publicised by GMOA in its website earlier and now removed from the web was only a first draft prepared by the Sri Lankan team for submission to their counterparts in India for consideration. The final form is finalised only after it goes through the whole process of the long-drawn negotiation that is yet to come. Hence, the protests made by a section of the society called ‘professionals’ appear to be based on ‘hearsay’ or what they believe it to contain once it is finalised by the two governments. It also appears from the pronouncements made by professionals that their objection is to CEPA in general and not to ETCA per se. As presented in the previous article under reference, CEPA was the natural evolution of the Indo-Lanka Free Trade Agreement or ILFTA signed in 1998 and implemented as from 2000. ILFTA covered only the trade in visible goods between Sri Lanka and India under preferential trading arrangements. A total of 5121 types of goods was covered in ILFTA. Given the fact that India’s is a much bigger economy than that of Sri Lanka, India offered duty concessions ranging from 25% to 100% to Sri Lanka for 4733 products. That included generous quotas of tea and garments at a duty rate of 50%. Sri Lanka, on its part, opened its economy to India only for 3842 products. Of course, when ILFTA was signed in 1998, there was no public debate on it as it has happened today because it was not considered necessary at that time. Economic policy governance was not a vital concern of the public in 1990s. Against this public apathy, the only critical review was made by the Central Bank which functioned as an impartial economic analyst in its good old days, first in confidential reports to the government and then to the public in special box articles and reviews in its Annual Reports beginning from 1998. For instance, in its Annual Report for 1998, the Central Bank warned the Government that ILFTA would simply cause a ‘trade diversion’ from other countries to India instead of bringing about the needed ‘trade creation’, the source of creating new wealth for Sri Lankans. The subsequent events proved that the Central Bank was correct because trade got shifted, especially in vehicles, machinery and pharmaceuticals, from Japan and other European countries to India making it Sri Lanka’s number one source of imports. Continuing its critical analysis, the Central Bank in its Annual Report for 1999 cautioned that Sri Lanka was unlikely to derive significant short term benefits out of ILFTA since most of the goods for which duty concessions had been granted had already enjoyed low tariff rates from India. Hence, it suggested that plans should be drawn for Sri Lanka to get long term benefits out of ILFTA. In its Annual Report for 2001, the Central Bank further commented that the two products which were to mainly benefit from ILFTA, namely, garments and tea, had performed very poorly in both 2000 and 2001. It also pointed out that non-tariff barriers which had been introduced by India had prevented Sri Lankan exporters to access the larger Indian markets as envisaged in the agreement. It therefore advised the Government to resolve these issues promptly through continuous negotiation with India. Following the wise counsel of the Central Bank, the Sri Lankan team negotiating with India managed to secure a greater access to Indian market for Sri Lanka’s trade in the subsequent few years. Accordingly, India opened its market for 4150 Sri Lankan products completely duty free as from 2003. India also designated three additional ports as entry points for Sri Lanka’s tea and garment exports to India. With that, as reported by the Central Bank in its Annual Report for 2003, trade between the two countries got picked up substantially paving way for the two countries to strengthen their trade relations in the form of a Comprehensive Economic Partnership Agreement, now known as CEPA. In addition to visible trade, CEPA covered several key areas in economic relationship with India. They included services, migration of natural persons, transfer of technology, promotion of private investment flows and cooperation in several vital areas for both countries. Private investment flows were to be harnessed in transportation, infrastructure, education, tourism and ICT. In the case of economic cooperation, CEPA had identified the need for modernising Sri Lanka’s ailing railway system with Indian technology and establishing world class higher learning institutions in the style of reputed Indian Institutes of Technology or IITs. It was the protests against the opening of the services sector and the migration of natural persons contained in CEPA that forced the Mahinda Rajapaksa Government to shelve it permanently. The protests were understandable because a sudden inflow of professionals into the local market would increase supply, promote competition and reduce the high professional fees which these professionals could now earn in a relatively protected market. However, the local consumers were to benefit immediately due to the larger choice set placed before them and lower fees they had to pay. The Sri Lanka’s economy was to benefit from an improvement in the standards of professional services. Even without CEPA, this has already taken place in the case of education and health services. A large number of Sri Lanka students who cannot get enough higher education places within the country proceeds to India every year; similarly, many patronise Indian hospitals for quality medical treatment for many serious ailments. This is a situation where the consumers cross the borders at great costs to buy services from another country. Under CEPA, it would be the service providers who will cross the borders making it more convenient and cheaper for the consumers in the host country. Many had feared that CEPA would open up the services sectors of the two countries wholesale in an equal manner, but that was not the case. India had offered to make a deeper and a wider opening of its services sector to Sri Lankan professionals. Sri Lanka has been requested to do it in small measures gradually. Accordingly, India would open up 80 sub sectors of services upfront, while Sri Lanka would do so only in 20 sub sectors. In this manner, India was to allow an unlimited number of visas to executives, managers and specialists to work in India; Sri Lanka was to do so only in two sectors, namely, IT and maritime services, but there-again, it was limited to investment projects made by Indians in the country. Thus, the fear that CEPA would open the floodgates to unemployed Indian specialists to invade Sri Lanka had been harboured by the protesting Sri Lankan professionals without reference to the proposed agreement. ETCA is in fact a modified CEPA without the provisions for the migration of natural persons, the main objection to it by local professional bodies. Professionals should not have any fear that services include migration of natural persons too. That is because, in terms of today’s global practices as pronounced by the 6th Edition of the IMF’s Balance of Payments Manual, services are only pure services and factor services that include the migration of natural persons are separate from them. Hence, any agreement which does not include the migration of natural persons does not include factor services. As mentioned above, ETCA is still in the initial study stage by expert groups in the two respective countries. Hence, through a proper consultative process, it could still accommodate the views of all those who have a stake in Sri Lanka’s broad economic and technology cooperation initiatives with India. Governments normally tend to design such agreements on its own without consulting the public on the premise that they have superior knowledge on these issues. But that premise is far from the truth in the current context where information is freely available to civil society organisations. Hence, fearing that civil society organisations will derail such plans, the agreements concerned are kept in utmost secrecy and released to public domain only after they have been inked by the respective governments. But by that time, significant irreversible damage could have happened. One such example is the Uma Oya Project signed by Sri Lanka with Iran without even referring it to the government’s economic advisor, the Central Bank. Hence, the present Government which has come to power on the promise of establishing good economic policy governance should listen to its critics with a positive mindset. There are numerous examples of economic disasters created by governments which have failed to listen to the loud voice of people. A truncated draft of ETCA had been posted to the website of GMOA in fulfilment of its commitment to full disclosure earlier. However, since GMOA has no authority to do so, it has now been removed from the web. Therefore, the initiative to make it public should now come from the Government side which holds ownership to it. A concept paper which would categorically assure the Sri Lankan professionals that there is no intention of opening up the ‘migration of natural persons’ should be publicised in a specially designed interactive website, also called 2.0 websites, and also in a social media net like the Facebook. The advantage of these social media nets are that they are user-friendly 2.0 webs available freely and quickly activated. It would not only take the fear out of the minds of the local professionals but also help the Government to learn of the other side of the view as well. At present, the Government is on an unnecessary and unproductive warpath with the country’s professionals who claim that they too have laboured to bring this Government to power. The Government has vowed to bring people to the street against the rebellious professionals but it would only prompt them to bring more professionals to the street in return. Such an escalation of violence through a series of senseless action and reaction would drain the Government of its limited energy which it could have used for better purposes. The Government feels that some of the professionals in the forefront of the protests are mere cat’s paws working for the agendas of power hungry politicians. But, it is only with an appeasing transparent policy that the Government could isolate those professionals whom it accuses of having personal agendas to oppose ETCA. The next article will look at how Sri Lanka and its professionals could benefit from having a wider economic partnership not only with India but also with other countries such as China and Singapore, simultaneously.